that is a very very hard to answer question...I've been puzzled myself. If Bandai can do the job in time, no need to wait for years til the next brand picks up an outdated topic. Bandai in house engineers at first and now they are using the same contracted engineers that Yamato does. Dose that his is working for both company at the same time? VF-19 Kai and YF-29 are all his work? No those are different engineers. Location:Soul is in Italy. Body in South Africa. Mind on another planet. Shoulders still too high and wide apart. Bandai Hobby, who make models and HCM toys, and Bandai Collector, who make collectible toys, works like different company and often compete with each other. We can see them use separate tables in the same trade shows, and run their own separate trade show like Gunpla Festival v.s. Tamashii Festival. Here is a similar observation from an employee of the official US distributor of Bandai. And the models are not that 'perfect'. Sure they look good from a skilled model builder, but they are really fragile and difficult to play with. The sticker and decal are too translucent and looks poor on dark color units, see example. There are other problems like oversize landing gears. Yep, really glad I settled for the heavily discounted blue-tinted Alto the first time, and didn't spring for any websclusives. 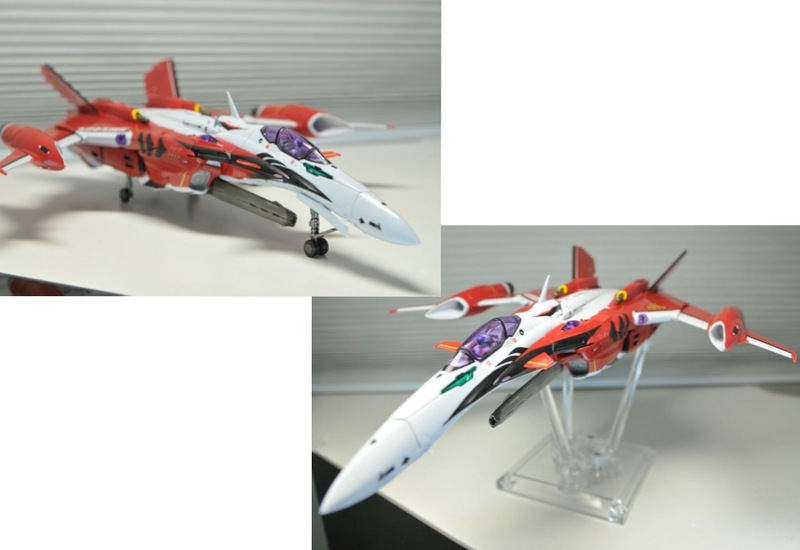 I will indeed be buying one of these, if not two, and can finally have a nicely colored and properly built VF-25. This thing looks good enough, I might not even mind buying a second one to get a bundle with super parts. Curses.. I might have to get them all this time. I just hope they have the sense not to make so much stuff exclusive this time. Alto's armor I can kind of understand, but he used super packs for most of the series. You know.. maybe they'll take a cue from the kits, and release a general super pack set with a set of color coded stickers? That would kind of go against everything they did with the first line (and actually make sense), but boy do I ever hope they will do that. 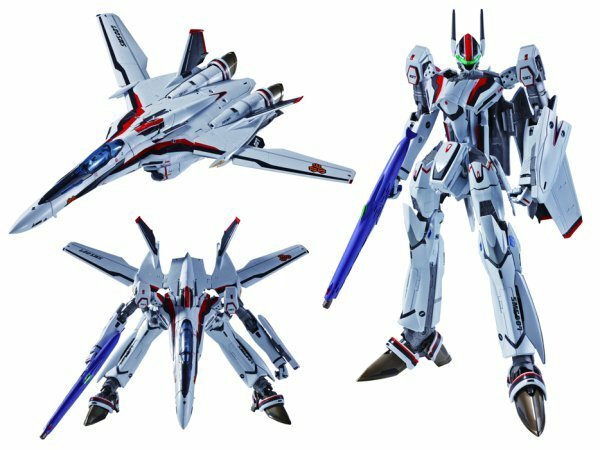 They can have their exclusive bundle packs if they want, but just have the decency to release a customizable generic set that any of the VF-25s can mount. Do that, and I will probably buy each and every one. Now, bring on the fighter mode pics! Sold, finally the fighter mode is correct! Hot DAMN!!! 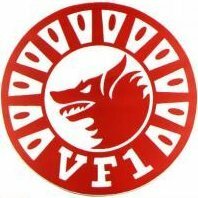 Last big question for the version 2 series, is will the different variants have their correct back plates or will they just use the F's for all of them like they did with the version 1. Yeah,that's true but it's not what I meant. It's not about fragility, materials quality, decals or swappable landing gears, etc. but about the overall proportions and anime accuracy of the valks in all three modes, and I think most of us believe the 1/72 models got it better than the V.1 DXs. Are these pics from Bandai's site? Yep, I'll be grabbing at least a few of these. Thumbs-up for a kickass gerwalk stance, and being able to see the ventral fins from directly above. Can't wait. You know though, I have to admit being really picky in this case.. but one of the most annoying features (to me) of the original? Why couldn't they let the wings sweep straight out? I hope they fix that on this release. They clearly did in the show, and I want to be able to fly my VF-25F across the window at sunset while humming "Cat's Diary" I mean, it's not a huge deal, and probably would be pretty easy to mod, but I'd like more detents in the wing sweep this time around. Which looks like standard press release pic they release to hobby stores. Glad I skipped version 1. I don't want to be a damp towel in the midst of all the excitement, but does anyone feel like the fighter mode is just a bit "off". Don't know, but I feel as though the length of the plane is too short and skewed in proportion. By all means it's better than version 1, but just a thought. Fighter mode fuselage/glove area seems too wide. Especially apparent in the Gerwalk mode pic. I think it's the angle, not my favorite angle to take pics of, can hide too may things, but I'm glad to see the legs are up nice and high. My thoughts exactly. I even cross referenced off of CG and the 1/72 model. The v2 fighter mode is noticeably wider imho. I'll worry more about it's accuracy when we see more pics of the fighter mode. I can tell from that pic that the left foot thruster isn't closed all the way, and the the right wing glove isn't pushed down into place as good as the left wing glove, you can tell by looking at how well the Red and Black markings line up between the wing gloves and fuselage in the pic. Also, the right tail isn't pushed up into place all the way in fighter mode either. I'll worry about what looks off and what doesn't more when I see a PROPERLY transformed fighter mode pic. Honestly, I'm just happy to see the legs sit up properly in fighter mode. Also, I bet that the wings will either be straight or much straighter on this sculpt too. Looks like I'll be selling my v1.0's pretty soon. Seeing it in fighter mode, the wings seem to be able to swing a little more forward than Ver. 1. I hope the cockpit has more details with decals for the display and not a gray color block. It does appear a little wider. The legs seem spread apart just a little bit further. I'm not worried about that, I think it's a matter of perspective. Normally, pictures of this kind are taken with normal to medium telephoto lenses to avoid perspective distortion. From what I can see I think the V.2 VF-25 picture was taken with a medium telephoto lens and looks right in terms of proportion. On the other side, he line art image of the VF-25 we are use to is a computer generated one showed as if taken with a wide-angle lens to increase some kind of striking effect. However, the result of using a wide-angle lens is a greater apparent perspective distortion when –as in this case- the camera is not aligned perpendicularly to the subject. Top view, side view, front view for each mode would be nice. does anyone wonder if the ventral fins retract completely inside the leg or is exposed behind/above (incorrectly) as in the 1/72 model?